Hi guys, I have a problem, I have a GTXGAMING server, and I have the InfiStar configured to restart every 3 hpras but it does not work. 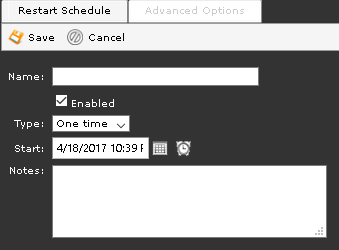 I can not find any place in my control panel where the restart time can be configured, could anyone help me? add a name as the title, if you see a triangle appear on the start date, then choose the next day, and the triangle will disappear. below is the tasks i have setup on mine. 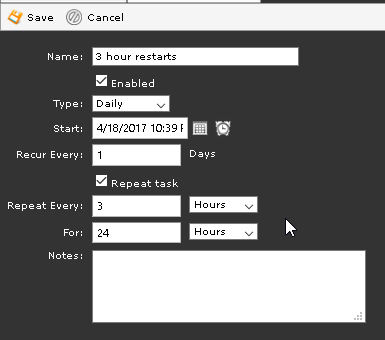 this is to setup static 3 hour restarts, if you jsut setup 1 task to restart just every 3 hours. Then the 3 hour timer would start over everytime you manually restart the server. using 3 hour tasks set at static times, then you cound restart the server 10 times in an hour and it will still start at the set times.